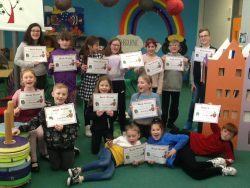 All of the enthusiastic bookworms and aspiring young actors were sad to see the end of book and drama club this month. 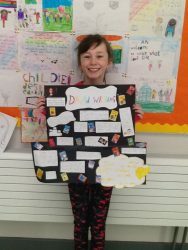 Katie K and Róisín organised the book and drama after school club this term. 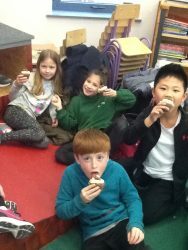 It was an exciting eight weeks filled with novels, book talk, drama and treats! 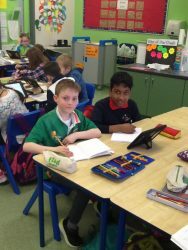 Each week we discussed books and favourite authors. 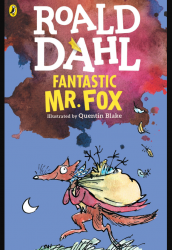 Róisín read ‘Fantastic Mr. Fox’ by Roald Dahl with first and second class. 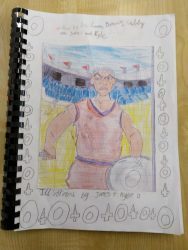 Whereas third to sixth class read ‘Mr. 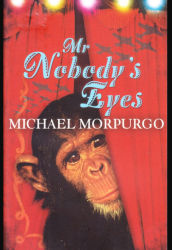 Nobody’s Eyes’ by Michael Morpurgo with Katie. 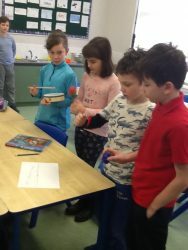 Drama was based on the chosen books. 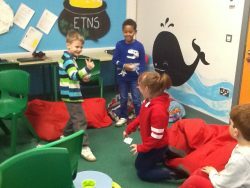 The children were enthusiastic and eager to engage in the drama. 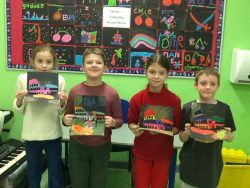 They created still images and improvisation scenes, depicting excerpts from the books. 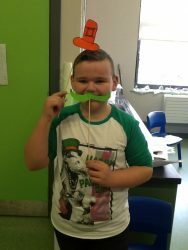 They developed the role of various characters and re-enacted their favourite parts of the stories. 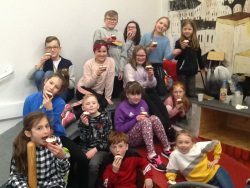 Katie and Róisín would like to thank all of the members of the book and drama club for all of their hard work and enthusiasm over the term. They hope to see you all next year! 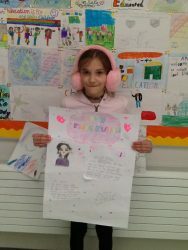 February was a busy month in Katie’s third class. 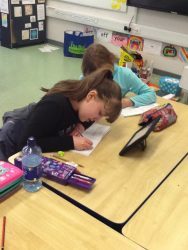 We learned about continents and completed a case study on Africa in geography lessons. 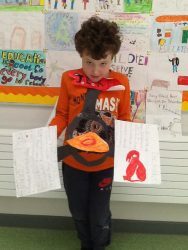 We learned about the countries, languages, natural features and animals in Africa. 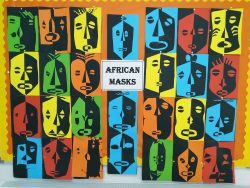 We also discovered the significance of masks in the African culture. 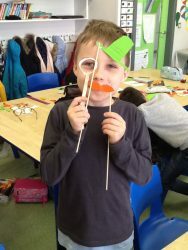 The African theme was further developed in our art lessons, where the children created colourful African masks. 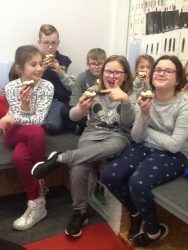 Katie’s class are huge fans of Roald Dahl and were delighted to hear that they would be reading the novel The Twits in February. 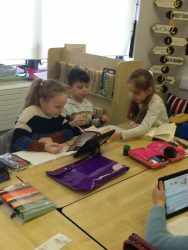 The boys and girls were very enthusiastic and had many laughs while reading the story. 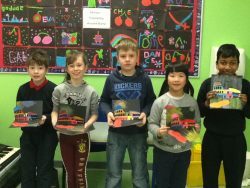 The children read the novel with great expression. 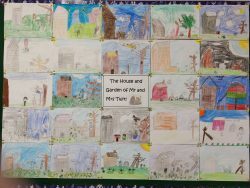 They were inspired by Roald Dahl’s illustrator Quentin Blake to draw the horrible Mr and Mrs Twit and their garden where they kept Muggle-Wump and his family captive! 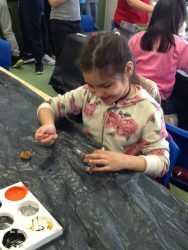 The children were once again given the opportunity to develop their sewing skills in Visual Arts. 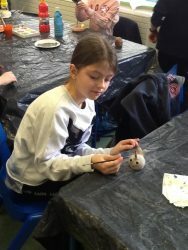 They created pictures using hessian, thread and buttons. 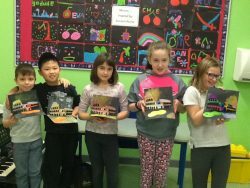 The class revised their sewing skills from Term 1 and learned a new sewing technique – cross-stitching. 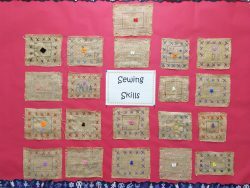 The boys and girls made huge improvements with their sewing skills since last term. 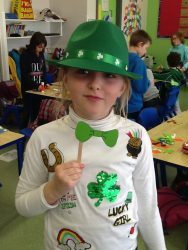 Our green Schools had a very exciting week this week. 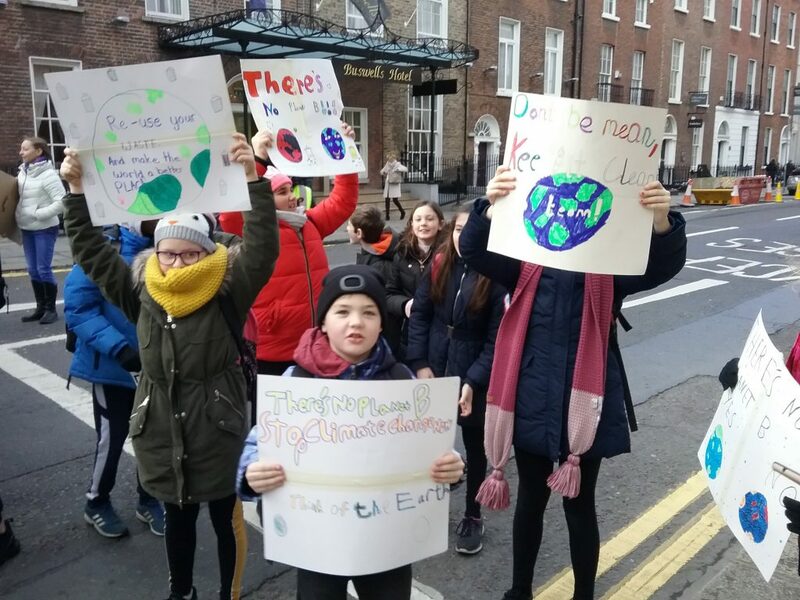 We attended a protest outside Leinster House in Dublin with over 400 other children from different schools. 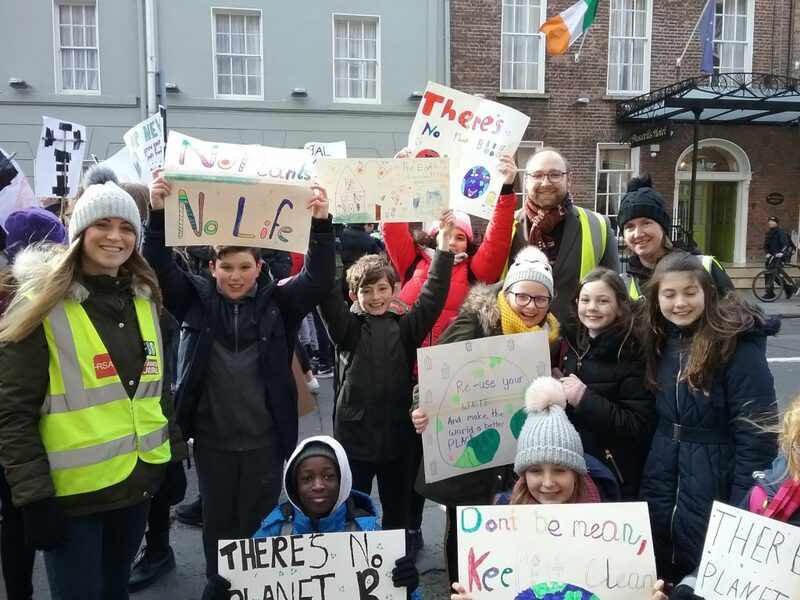 We were protesting the inaction of our government to tackle the very important issue of Climate change. 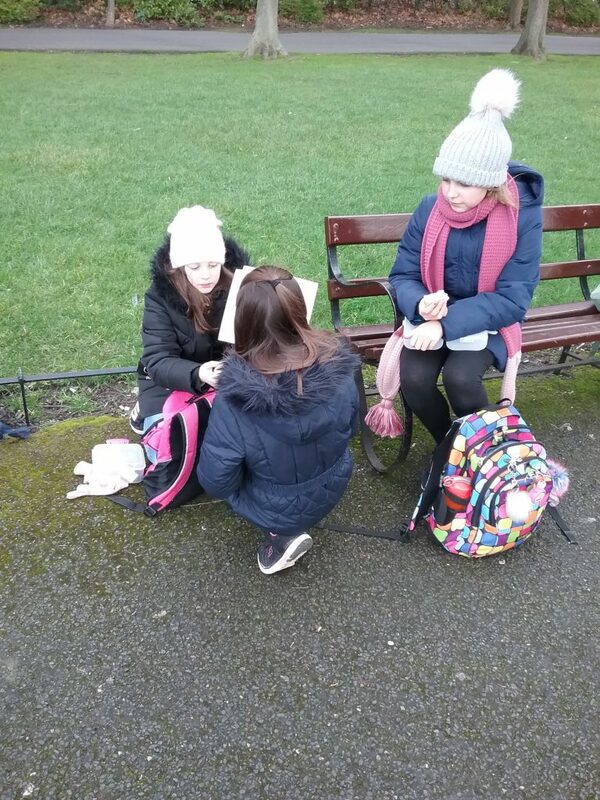 We got the bus from Ashbourne and walked there. We shouted slogans like “We want change” and “What do we want? 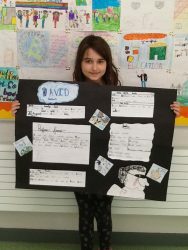 Climate Action! When do we want it? NOW!”. We even made it on the news! 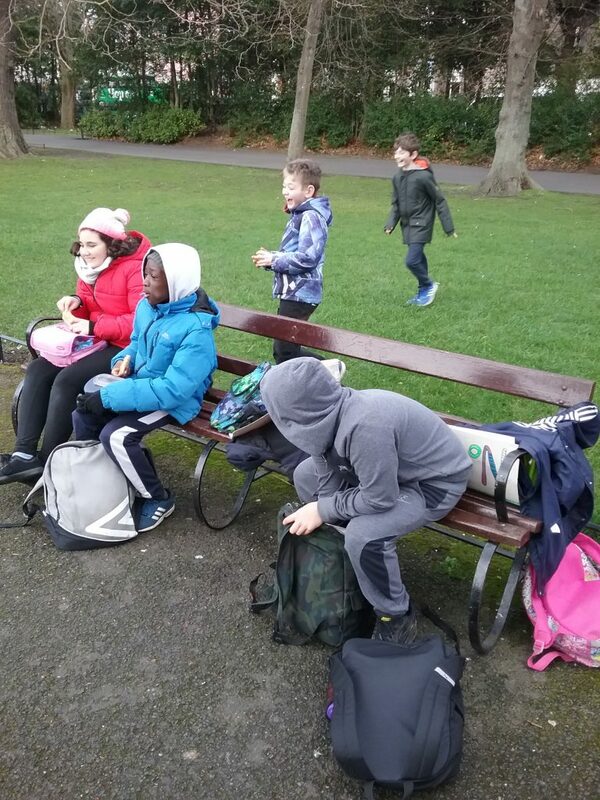 After the protest we had our lunch in St. Stephens Green before getting the bus back. We would like to thank our teachers Emily, Robert and Carole Pinto for coming with us ! 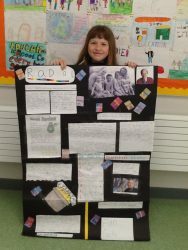 January was a very busy month in Katie’s third class. 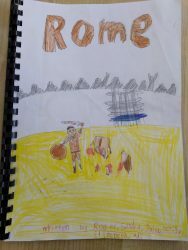 We learned about Ancient Rome and completed group projects based on this topic. 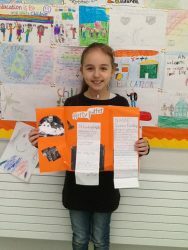 Each project was bound into a book and displayed for all to see. 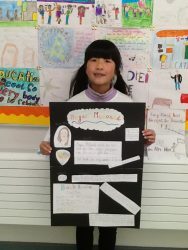 All the projects included information about the history of Ancient Rome, slavery, Ancient Roman society and much more. 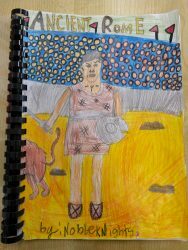 The children also wrote diary entries to show the life of an Ancient Roman. 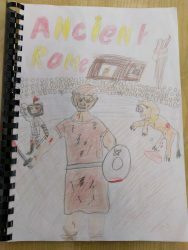 Gladiators were of significant interest while learning about Ancient Rome. 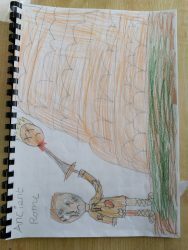 The boys and girls were fascinated to learn about the battles gladiators endured in the Colosseum. 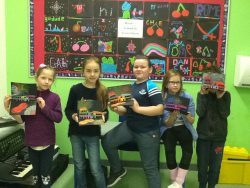 They created their very own pop up Colosseum using chalk pastels. 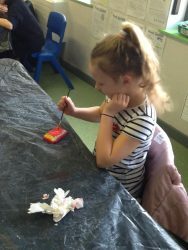 We also learnt about mosaics in Ancient Roman times and created our own mosaics using small squares of coloured card. 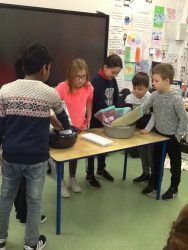 In science the boys and girls learned about heat and completed an experiment to investigate which material would work best as an insulator. 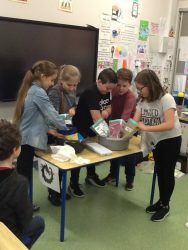 Each group was put on a timer to see how long they could keep their hands in a bucket of iced water using various pieces of insulating materials as gloves. 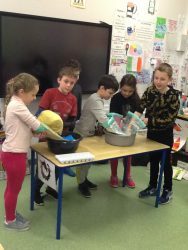 It was clear that the blubber (or butter as we used!) worked as the best insulator. 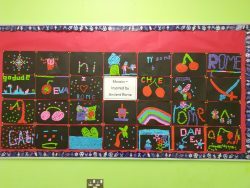 We completed many lessons based on music literacy. 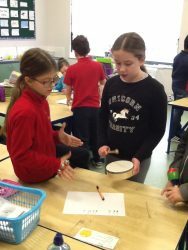 We focused on identifying different types of music values – semibreves, minims, crotchets and quavers. 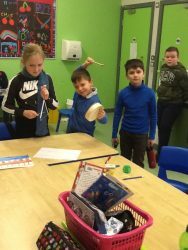 Everyone was very creative and composed their own rhythms using percussion instruments.